It all works together in a seamless, user-friendly way. Nest is officially in the home-security business. 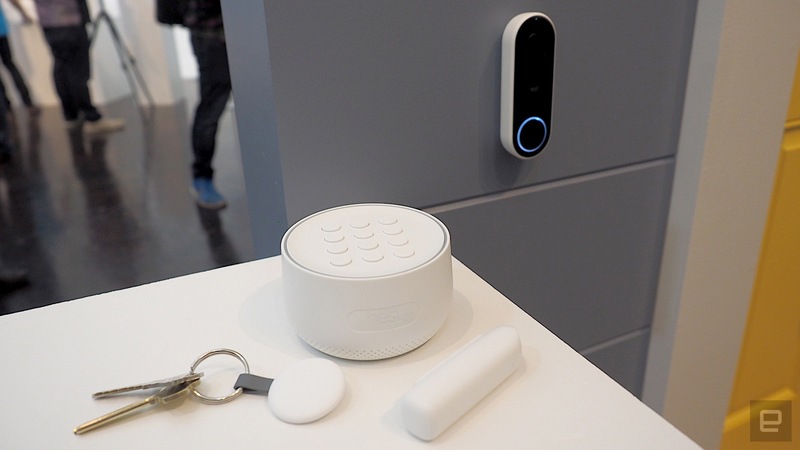 At a press conference in San Francisco today, the company introduced a slew of devices: a video doorbell, an updated outdoor camera and a security system that includes a keypad base, a motion sensor and a keychain fob. For a company that's already so synonymous with the connected home, having it all integrated into one system makes a lot of sense. In a demo room immediately after the event, Nest showed off how all of it could work together. 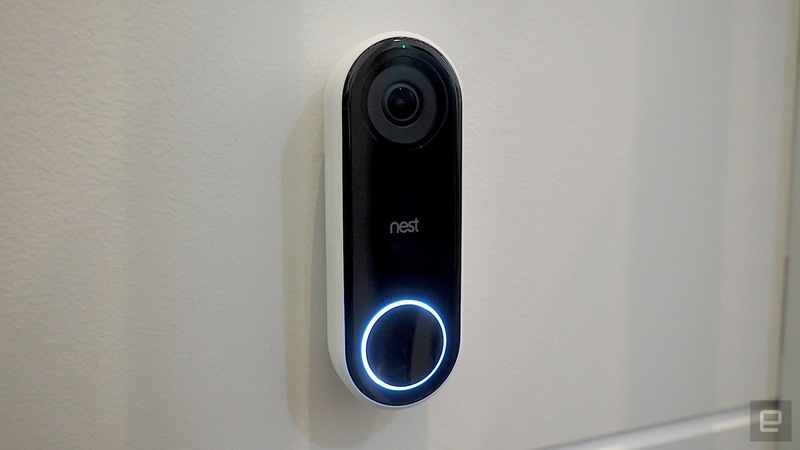 It had the Nest Cam IQ outdoor camera set up in an outdoor porch setting, the Hello video doorbell connected near the door and the Nest Detect motion sensors strategically attached to doors and windows. The Detect can sense not only open-and-close movements but also motion in the room if it is stuck onto a wall. Communicating with the Detect is the Nest Guard, an all-in-one security base with a keypad as well as a motion sensor. It also has an NFC reader, which is great because you can unlock the security system using the Nest Tag, a fob that you can attach to a keychain. Simply tap it on the Nest Guard and your security system will be disabled. The Guard needs to be plugged in and communicates with the Detect over WiFi, but there is a battery backup and an optional cellular backup service of $5 per month if the power goes out. The Guard security base is also the source of the alarm, which, as a group of journalists learned in the demo, is very, very loud. Yet I also thought it had a pleasant musical tune, which is an unusual thing to think about a security alarm. Controlling it all is the same ol' Nest app that owners are already familiar with. 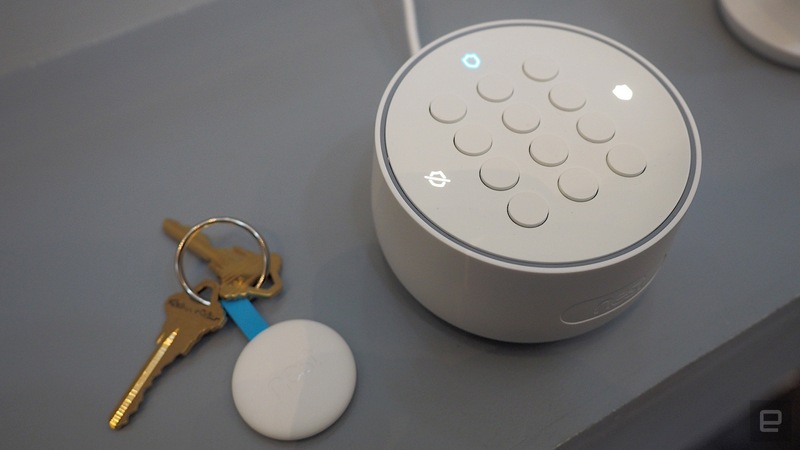 You can use it to enable or disable the Nest Secure system, and you can also have a reminder setting to, well, remind you to enable the security every night. You can also enable and disable the security just by entering a number in the keypad in the old-fashioned way. The Guard has an LED light that glows green when the alarm is set. Of course, like with the old Nest app, you can use it to see the viewpoint of each camera in your home, whether it's your old Nest cams or the new outdoor one. The same app will also work with Hello, the new video doorbell. The difference with the Hello, however, is that you can see a person head to toe, thanks to its 4:3 video ratio. What's more, you can pan the video to the left or right, to get a better idea of what's at your doorstep. And just like the other Nest cams, it has 24/7 livestreaming and night vision, and you have the option of looking through hours and days of archival footage, as long as you pay the Aware subscription fee (for about $10 per month). It also promises facial recognition and person detection, so it'll let you know if the creature at your door is a neighbor or just a curious dog. If it's someone you know, say your husband or wife, then it might let you know he or she is home if you're out and about. One particularly neat thing with the Nest Hello is that it not only works when the doorbell is rung but will also send you a notification if someone approaches your door. This is particularly useful for when that delivery guy drops off a package without bothering to ring your doorbell. It also has a Nap Time mode, which shuts off the doorbell for a set period of time. If someone comes to your door during that time, you'll get a notification on your phone instead. Oh, and it'll also light up your doorstep when you arrive home. That's a nice touch. The new Nest Cam IQ outdoor has the exact same people-detection and facial-recognition tech, except of course this one is meant to be mounted outdoors, perhaps at the front porch or the backyard. It's meant to be hardwired in, and it is both tamper-resistant and weatherproof. And though it wasn't announced at this event, the whole system will also work with the upcoming Yale smart lock. 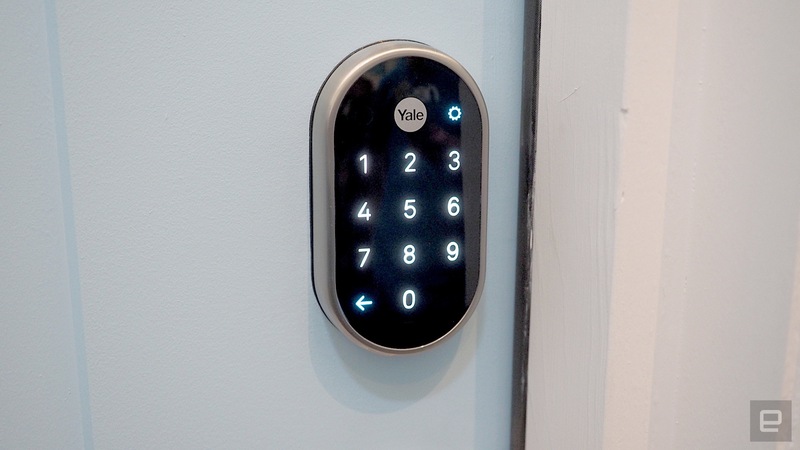 For example, if you're coming home and you go to unlock your door with the Yale lock, this will automatically disable the Nest Guard security system without you having to do anything. Similarly, let's say your mother rang your Nest Hello. You can recognize that she's there and unlock the door right from the app. All in all, the Nest security package seems a whole lot more user-friendly than existing security systems like ADT. There's no need to hardwire your home with cables or wires, and it seems much more integrated with the rest of your home than some of the other wireless security systems out there. Plus it all works with portable Nest cams that you might already have. As a reminder, the Nest Secure starter pack -- which includes the Nest Guard, two Nest Detects and two Nest Tags -- will retail for around $499. Additional Detects are $59 each, and additional Tags are $25 each. A Secure starter pack that includes the regular version of the Outdoor Cam (the one released last year) is available for $598 from both Nest.com and Best Buy. The new Outdoor IQ cam, however, is $349 for one or $598 for two. The Nest Secure as well as the Outdoor IQ cams will be available in November this year. The price of the Nest Hello is yet to be determined, but it'll be available early next year.